Reviva Labs Creating the Perfect (face) Canvas Giveaway! I've got a nice giveaway package from Reviva Labs that two of my followers will receive! The lovely Anna from Reviva Labs worked with me to select three of my favorite products, and all three work very well individually, or in combination to create the perfect canvas for your make up application. Their Rosewater Facial Spray, Hyaluronic Acid Serum, and Makeup Primer are all included in each prize package. All three of these products are repeat performers for me, and I'm seldom without a backup of any one of them! They all provide me with instant results, and with continued use, I notice that my skin becomes more restored, toned and hydrated. Let me tell you a little bit about each product, how I use them, and what I like about them. Rosewater Facial Spray - 8 fl. oz./$9.00: This multi-purpose spray can be used to prep skin by hydrating, which helps your serums and moisturizers absorb better. It also refreshes your skin, sets your make up, can act as a mild toner, eliminate dry areas of skin, and more. This acts much the same for me as MAC Fix+ at a fraction of the cost. The mist is very fine, which makes it perfect for setting make up. I sometimes spray it directly on my buffing brush and work in small circular motions over my foundation. This gives my skin a dewier look than when I simply mist it over my face. Infused with distilled rosewater, aloe, herbs, mineral and hyaluronic acid, this simple yet powerful mist is a staple in my everyday beauty routine. I use it right out of the shower on my face, neck and décolletage. I use it again when I've finished applying my make up as a setting spray. I also use it at night directly after washing my face. I have used similar products and I can compare this to MAC Fix+ (3.4 fl. oz./$21.00) and Jurlique Rosewater Balancing Mist (3.3 fl. oz./$31.00). I prefer Reviva's product because I get the same results without spending nearly as much money, and I prefer a lightweight plastic bottle to Jurlique's glass bottle. If you click on the product links, you can view all of the ingredients. Hyaluronic Acid Serum - 1 fl. oz./$22.00: This product helps your skin "gain and retain skin moisture" and this equates to a reduction of lines and creases. It plumps up facial skin tissue, and in addition to using it on my face as a serum, I also apply it to my lips for the same reasons. Hyaluronic acid has been a great discovery for me, and I now seek out products that contain this ingredient. The Rosewater Facial Spray also contains hyaluronic acid. I use this product as a serum directly after the Rosewater Facial Spray and before my moisturizer. It's a relatively thin clear fluid that absorbs quickly, and I don't notice a scent. It can also be used as a spot treatment for dry areas of skin, which I tend to get in the colder months. While I've used plenty of other facial serums, I haven't tried any others that are just hyaluronic acid, so I can't compare this to another product. Makeup Primer - 1 fl. oz./$19.50: I think this product was my first venture into facial primers. I've since sampled and accumulated several more facial primers, but Reviva's continues to be my "go to" primer. Like many primers, it's a clear but slightly milky gel-like formula. I use a very small amount, so the 1 oz. bottle lasts quite a long time. I sometimes use it alone, or sometimes I apply it over my moisturizer. It glides on effortlessly, and feels like silk on my fingertips. It leaves my face looking lightly buffed, as if the fine lines and pores have been blurred and diminished, and the skin appears to have a satin or eggshell finish as opposed to a matte finish. Photoshop in a bottle? Maybe not that perfecting, but it's definitely an immediate noticeable improvement. It doesn't just improve the look of my skin's texture and finish, it also makes my foundation (powder or liquid) glide on more evenly, and keeps my make up in place until I remove it. I have combination skin and it does a great job of controlling the more oily T-Zone while still moisturizing and softening the drier areas of my face. It feels oily on my fingers, but oddly, it doesn't feel that way while I'm applying it. I use just a little bit--you may have to experiment before you find the right amount for you--all over my face before I apply my make up. I let it absorb for a couple of minutes before proceeding with my make up. I took a look at the ingredients in the Reviva product and compared it to some of the other primers I have. The Reviva product has a much simpler ingredient list, and I know what the ingredients are. I was amazed and surprised at the comparison. Take a look. Reviva Labs Makeup Primer Ingredients: Cyclopentasiloxane, dimethicone, vitamin A palmitate, vitamin D3 (cholecalciferol), olive oil, coenzyme Q10, squalane. Smashbox Photo Finish Ingredients: Cyclopentasiloxane, Dimethicone Crosspolymer, Dimethicone, Trisiloxane, Silica, Dimethicone/ Vinyldimethicone Crosspolymer, Ethylhexyl Salicylate, Retinyl Palmitate, Tocopheryl Acetate, Carthamus Tinctorius (Safflower) Seed Extract, Propylene Glycol, Water (Aqua, Eau), Vitis Vinifera (Grape) Seed Extract, Cola Acuminata Seed Extract, Camellia Oleifera Leaf Extract. Too Faced Primed & Poreless Ingredients: Cyclopentasiloxane, Dimethicone Crosspolymer, Dimethiconol, Caprylic/Capric, Triglyceride, HDI/Trimethylol Hexyllactone Crossploymer, Dimethicone/Vinyl Dimethicone, Crosspolymer, Camellia Oleifera Seed Oil, Phenoxyethanol, Silica, Tetrahexyldecyl, Ascorbate, Ethylhexylglycerin, Cyclodextrin, Cyclohexasiloxane, Retinol, Diacetyl Boldine, PPG-26-Buteth-26, Arctostaphylos Uva Ursi Leaf Extract, Morus Alba Bark Extract, Polysorbate 80, PEG-40 Hydrogenated Castor Oil, Hedra Helix (Ivy) Extract, BHT, Cycloheptasiloxane, Tocopheryl Acetate, Retinyl Palmitate, Bioflavonoids, Ascorbyl, Palmitate, Allantoin, Mica CI 77019, Bismuth Oxychloride CI 77163, Chromium Oxide Greens CI 77288, Titanium Dioxide CI 77891, Iron Oxides CI 77491, Iron Oxides CI 77492, Iron Oxides CI 77499. Becca Resurfacing Primer Ingredients: Water, Cyclopentasiloxane, Dimethicone, Isododecane, Hydrogenated Didecene, Tribehenin, Titanium Dioxide, Dimethicone/Vinyl Dimethicone Crosspolymer, Cetyl PEG/PPG-10/1 Dimethicone, Dimethicone Crosspolymer, Disteardimonium Hectorite, Glycerin, Polymethylsilsesquioxane, Phenoxyethanol, Tropolone, Butylene Glycole, Sodium Dehydroacetate, Silica, Ascorbyl Palmitate, Disodium EDTA, Retinyl Pamitate, Tocopheryl Acetate, Enantia Chlorantha Bark Extract, Oleanolic Acid. Laura Mercier Foundation Primer Radiance Ingredients: Water, Hydrogenated Didecene, Glycerin, Pvp, Ricinus Communis (Castor) Seed Oil, Sorbitan Stearate, Mica (Ci 77019), Cetyl Alcohol, Simmondsia Chinensis (Jojoba) Seed Oil, Glyceryl Stearate, Propylene Glycol Stearate, Phenoxyethanol, Hydroxyethyl Acrylate/ Sodium Acryloyldimethyl Taurate Copolymer, Propylene Glycol Isostearate, Glyceryl Isostearate, 1,2-Hexanediol, Boron Nitride, Squalane, Caprylyl Glycol, Oleth-25, Ceteth-25, Tocopherol Acetate, Polysorbate 60, Retinyl Palmitate, Tin Oxide, Triethoxycaprylylsilane, Ascorbyl Palmitate, Triethanolamine, Tropolone, Butylene Glycol, Plankton Extract. May Contain (+/-): Ci 77891 (Titanium Dioxide), Ci 77491 (Iron Oxide). Korres Quercetin & Oak Age Reversing Primer Ingredients: Aqua (Water), Caprylic/Capric Triglyceride, Dicaprylyl Ether, Cetearyl Alcohol, Coco-Caprylate/Caprate, Glyceryl Stearate, Propanediol, Glyceryl Stearate Citrate, Microcrystalline Cellulose, Alcohol, Glycerin, Phenoxyethanol, Citrus Paradisi (Grapefruit) Peel Oil, Simmondsia Chinensis (Jojoba) Seed Oil, Limonene, Ethylhexylglycerin, Xanthan Gum, Cellulose Gum, Glycosphingolipids / Triticum Vulgare (Wheat) Flour Lipids, Hordeum Vulgare Extract, Tocopherol, Spilanthes Acmella Flower Extract, Sodium Hyaluronate, Sodium Phytate, Silica Dimethyl Silylate, Glyceryl Oleate, Quercetin Caprylate, Quercus Robur Bark Extract, Citral, Linalool. Interesting, isn't it? I didn't plan on comparing all of those ingredients, but it does give a good representation of the simplicity you'll find in Reviva's products. Effective simplicity, which is something that becomes more and more important as we learn about the effects of ingredients in the products and foods that we're using. Reviva's products are paraben free and cruelty free. Entry Details: Two winners will be chosen to receive this trio of my favorite Reviva Labs products. To enter, just leave your eMail in the comments below. If you aren't comfortable leaving your eMail, just mention that in the comments and be sure to check back on March 1 when I announce the winner. You can then contact me (mej0620@hotmail.com) with your information. U.S. entries only please, as prizes will be shipped to you directly from Reviva Labs. Contest ends 2/28/13 at midnight. If you have any skin care questions, please feel free to leave those with your entry comment as well. Stephen Strassler, Reviva's founder, is an extremely knowledgeable skin care expert, and I would love to have him answer some of your questions. I can include the answers in my upcoming Reviva reviews. They are celebrating their 40th Anniversary this year, so congratulations to Reviva Labs on that milestone! I like what I've tried so far from Reviva Labs. I'd love to try these too. I'd love to give these a whirl! Thanks for a lovely giveaway. Oh, pick me! I love Reviva Labs! I've never tried any Reviva Labs products yet, but I've been wanting to! Thanks for the awesome giveaway! These sound like they would feel & work amazingly well :). Thank you for the chance! The hyaluronic acid serum sounds great! 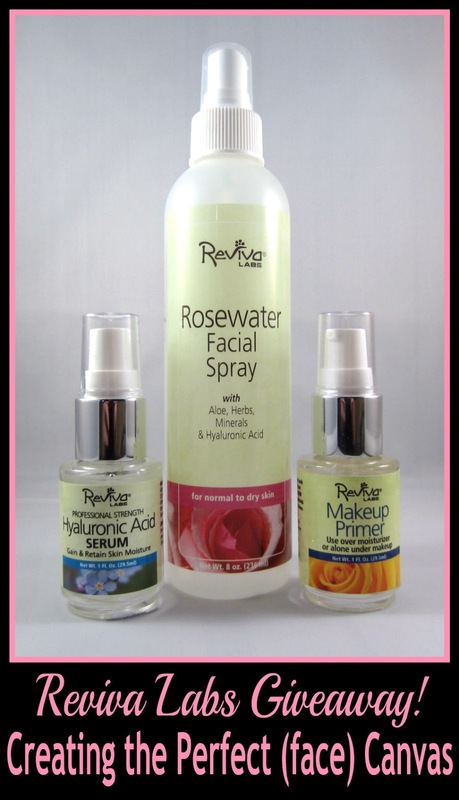 I've been dying to try the Rosewater Facial Spray! Fingers crossed for winning & thanks for toing this. I would love to try a straight hyaluronic acid cream like this. I don't think that most products contain enough of the ingredient to give more than a taste of the great effects that it could have on our skin. The rosewater toner sounds wonderfully soothing and I have read nothing but good reviews of the Primer! Thank you so much for offering these as I would truly love to try them all. I love Reviva products and so would love to win this. I'm intrigued & thanks for the giveaway. Good job comparing ingredient lists--that really drives the point home. hippanda at gmail dot com. I've never tried any Reviva products before. Thank you for the chance to win them.